Damn those BMWs. When they aren't parked across multiple handicapped spaces or being generally awesome to drive, they're sparking fires that ruin other people's cars at airports. Seriously. That's exactly what happened yesterday at Seattle's Sea-Tac Airport, according to KIRO-TV and other news outlets. 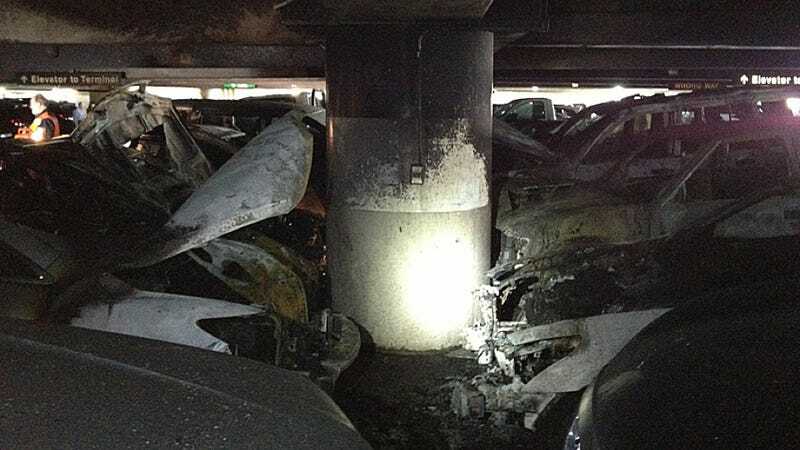 The fire was first reported on the sixth floor of the garage around 6:45 a.m., and it quickly moved to consume several other vehicles. Thankfully, no one was hurt, but airport officials estimated damage to be around $250,000. Fire investigators believe that a mechanical problem in a BMW started the fire. Unfortunately, the news reports I read didn't say what kind of BMW it was. Come on, guys! We gotta know! This photo gallery shows a torched E46, so maybe that was it. Or maybe it was one of those Super Replicas Ferraris with a BMW V12 engine pretending to be a real Ferrari. Another great note: it turns out that the Sea-Tac parking garage doesn't have any surveillance cameras or a sprinkler system. So if you want to steal something out of a car, or light yours on fire to rip off your insurance company, that's the place to do it.